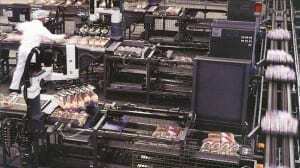 We are one of the bakery industry’s most trusted, innovative and reliable suppliers for commercial bakery automation. Whether you handle bread and buns using baskets or trays – in stacks, dollies or mobile racks, Cannon Equipment can help you develop a material handling system that meets the distribution requirements of your production line. From basket unstackers to pattern formers, stackers, stack conveyors and everything in between, Cannon Equipment is one of the industries most trusted, innovative and reliable suppliers for automation after the bagger. Using automated systems in your bakery allows you to save valuable time and labor while increasing product consistency, product volume and overall efficiency. Why Choose CannonMachinery for your Commercial Bakery needs?